We’re starting something new, this week, at the Locust Moon Press end of our operation. Each Tuesday, we’re going to start sharing a little taste (and on days like today, when you’re lucky, a big one) of a comic we currently have in the works. 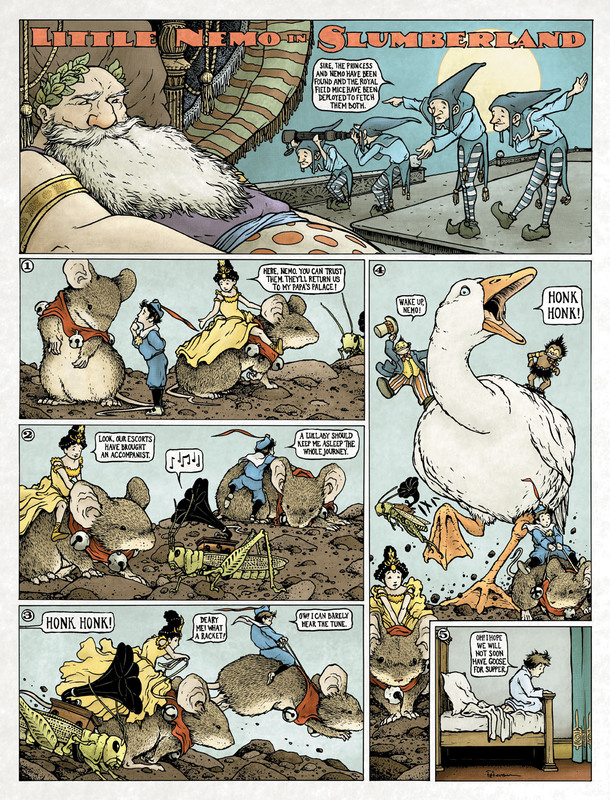 For our first go, we’ve decided to give you a rather giant treat…a full page from our most special and spectacular upcoming book, LITTLE NEMO: DREAM ANOTHER DREAM! This’ll be one of only a select few pages we’re sharing online (out of the 100 or so strips that’ll be in the final book), and we don’t plan on letting loose any others anytime soon. So who are we going to show off this time? DAVID PETERSEN. He wows us at each and every turn of his singularly epic MOUSE GUARD. He literally builds the worlds he creates. I have his poster for BRAVE hanging in my living room. This is his Slumberland — and trust me, you’re going to want to see this at 16″ x 21″ as intended in DREAM ANOTHER DREAM. The goose alone is nearly a foot tall! This entry was posted in Making Comics, Tuesday Tease and tagged David Petersen, dream another dream, little nemo, locust moon press. Bookmark the permalink.